It’s August 29th, and it’s time for Pin-spired! 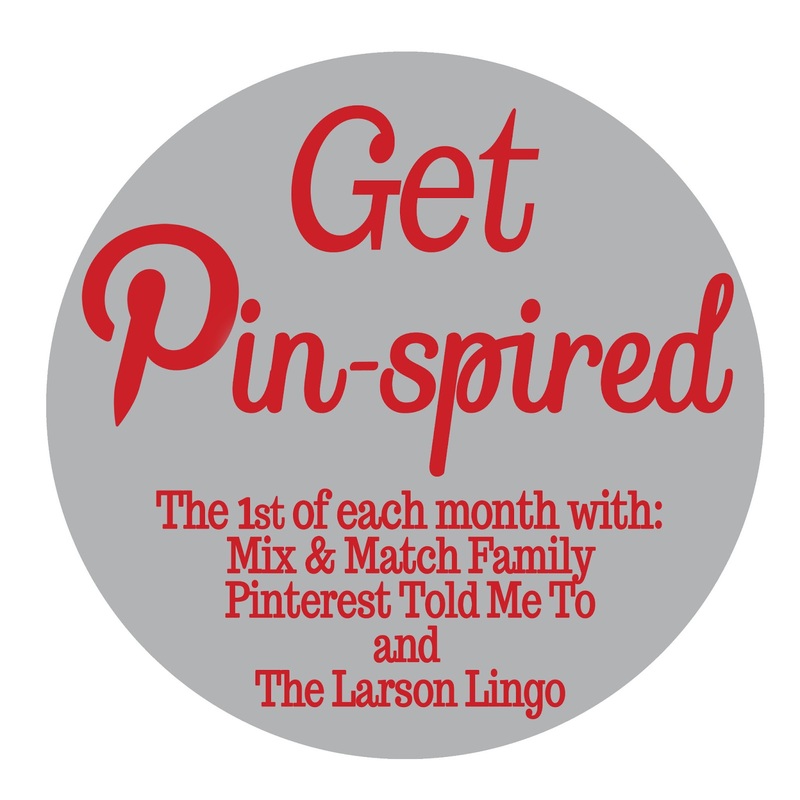 As always, as the first of the month approaches (and we like to do it over a weekend), I partner up with Shay at Mix and Match Family and Mel at The Larson Lingo to Get Pin-Spired! We’re hoping that all of you will join in the fun! The focus of the post today is a super simple look. Instead of a black sweater, I wore my black MUST HAVE shirt. Remember to size down in this shirt. I am wearing an x-small. 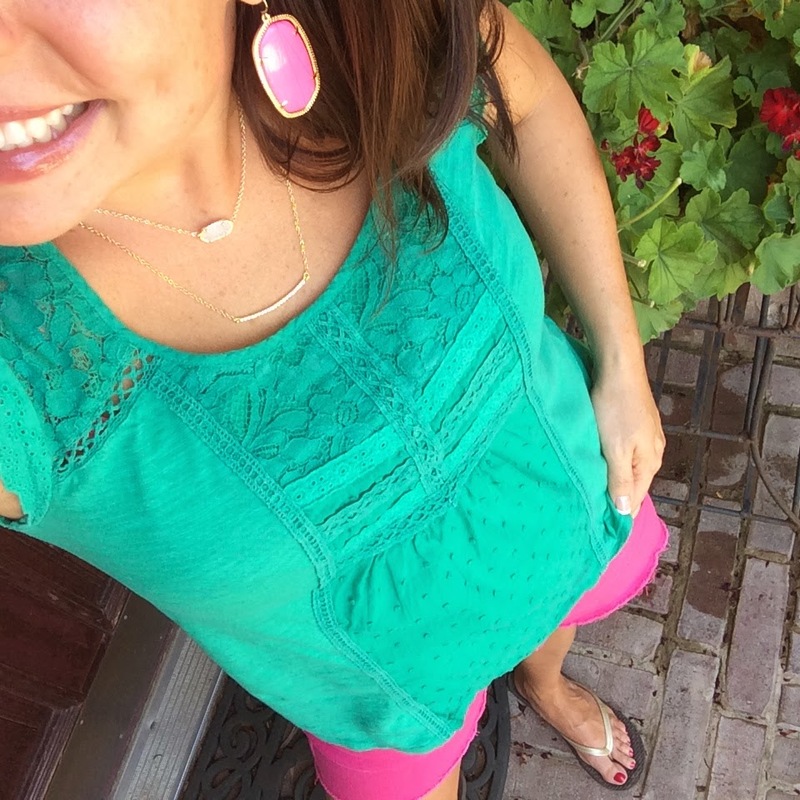 Kendra Scott is having a Labor Day sale with 15% OFF and FREE SHIPPING off of your entire order with the code 2014LDW. All women’s Converse at Nordstrom HERE. Accessory Concierge is extending us a 20% OFF code. Just enter the code PTMT20 and you’re all set! I can’t say enough great things about THIS bracelet or THIS necklace. Love them both so much! *There’s also a Labor Day sale going on at Accessory Concierge! 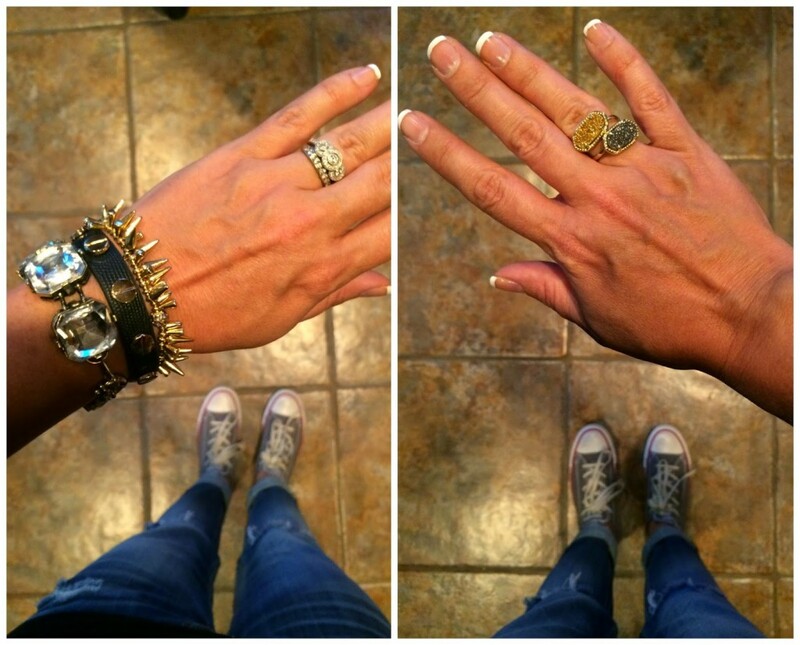 Click HERE to see a spiky necklace for $12 that looks like the gold spikey S and D bracelet! Click HERE for a sky blue multi strand necklace. If you want a closer look at the Converse that are similar to mine, here you go! These have zippers, and I LOVE the zippers!!!! Totally wish mine had the zippers actually. Click HERE (only 6 sizes left when the post went live)! They are 33% OFF right now making them only $43.51!!!!! Make sure you order 1/2 size down. 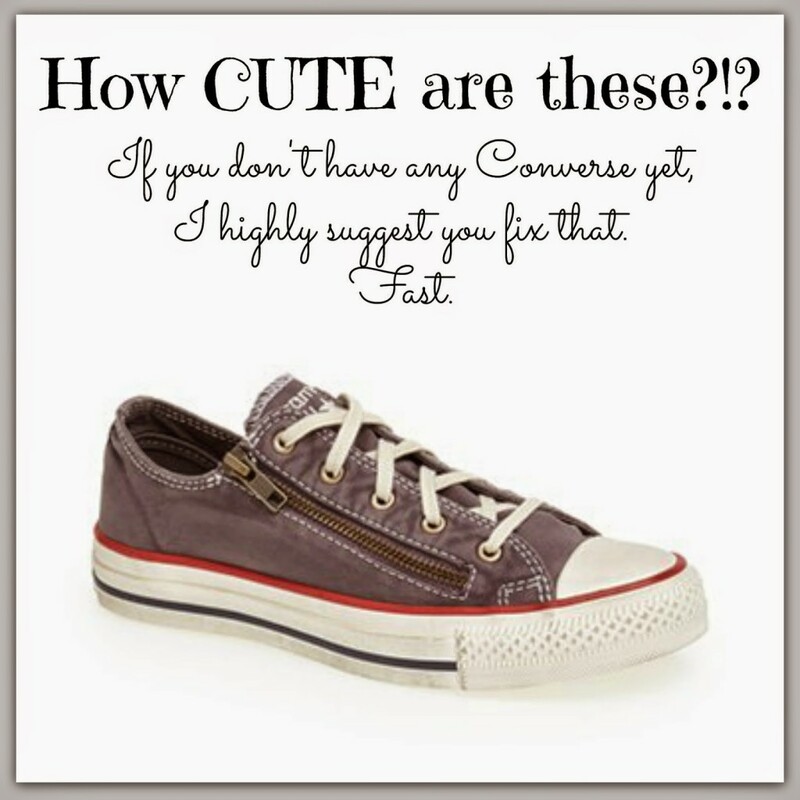 If you prefer to NOT have the zippers, click HERE for all of the other women’s converse choices. I like the light grey, the black, the white, and the navy! I JUST SAW THAT NORDSTROM IS RUNNING A SPECIAL PROMOTION RIGHT NOW on the classic converse. Converse are regularly $44.95 , but right now they are BUY 2 FOR $75 ! Buy 2 for you…or Buy 1 for yourself and and 1 for your daughter…or anybody else! This next outfit was the first outfit I pinned after I ordered my converse last year. It was super simple, and I already had all of the needed pieces. That’s all you need! If you already have the other 3 pieces, just add in the converse and you’re set! So here’s a side by side of the looks. Totally simple, but Totally cute. 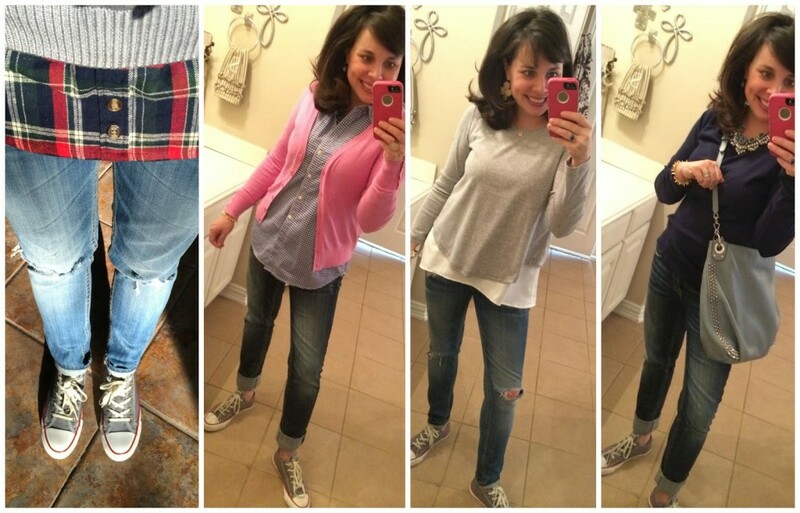 Here is a collage of just a handful of times I’ve worn my grey ones since purchasing them. Remember to order a 1/2 size down! Thinking they might be on my Christmas list. Look at this next pinterest inspiration and tell me you don’t want to wear that entire outfit. 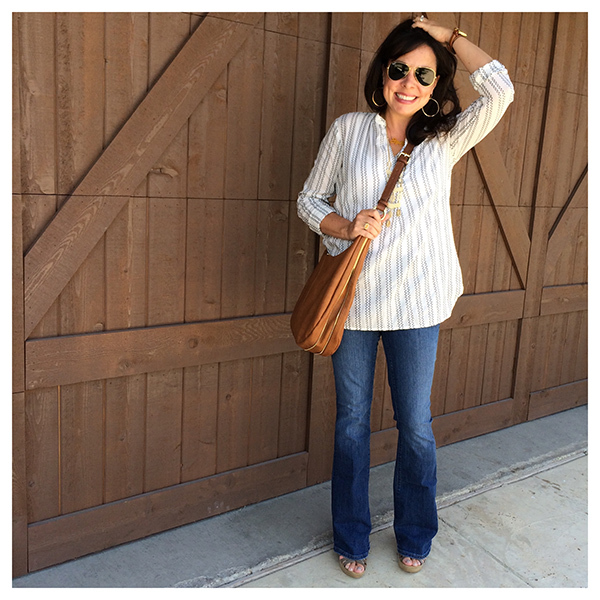 Click HERE for a similar shirt that I found last night at Nordstrom! 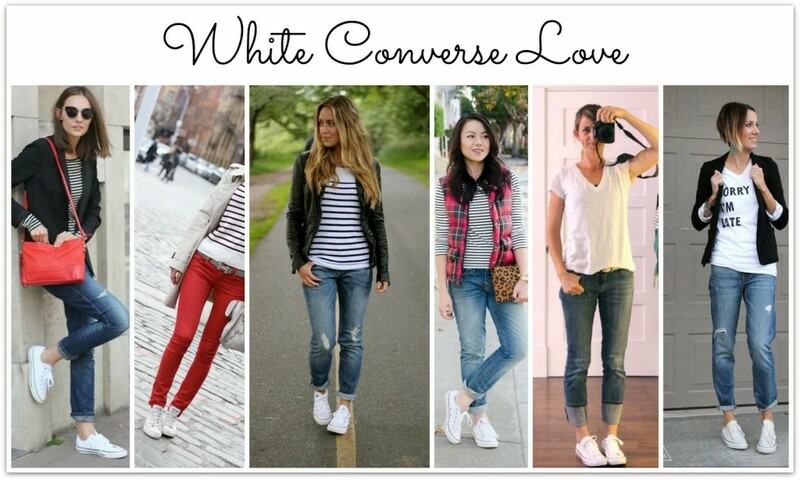 Look below and see how cute and FRESH white converse are! Click HERE for the classic white. Click HERE for shoreline version with the elastic back. Aren’t those images pretty convincing? They all have this cool and laid back (BUT SUPER CUTE AT THE SAME TIME) vibe. And look at these outfits with dark converse. Totally DYING over that look on the far left. How darling is she?! And I never in a million years would have thought I would be a fan of the black ones. But I am. So, that was my Pinspired look for the month! 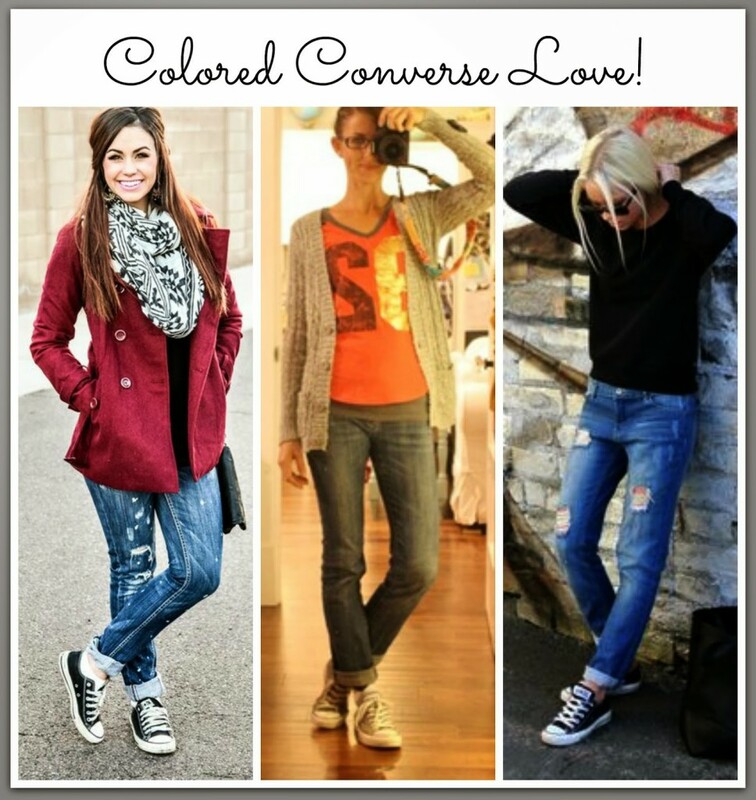 MUST HAVE jeans, MUST HAVE shirt, and converse. You can’t get any easier than that! eden bracelet HERE, similar pink cardigan HERE with amazing reviews! I think this next picture illustrates nicely how the flats add a great pop of color to an otherwise basic outfit. 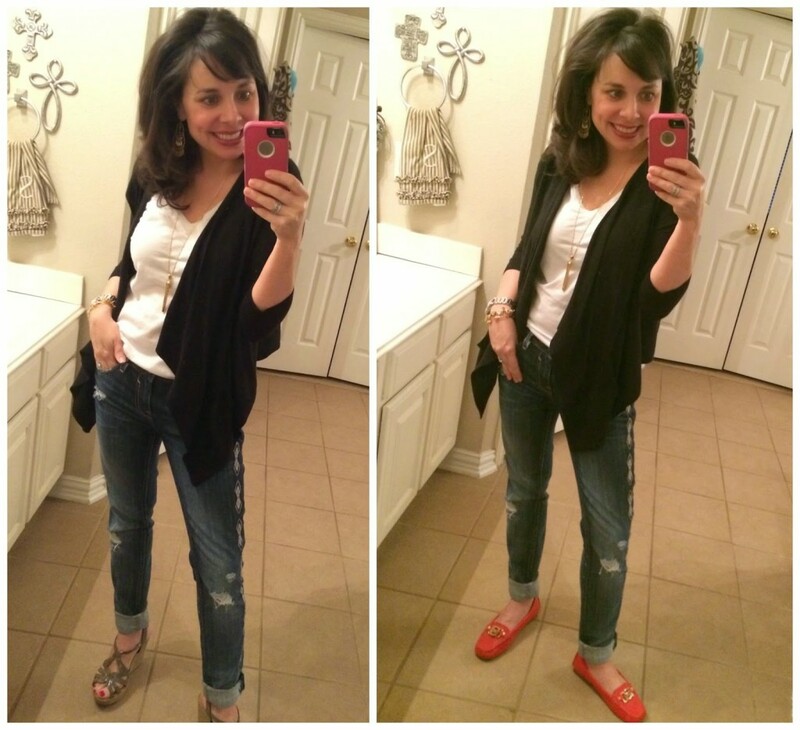 Must have wedges on the left (sold out), MK Mandarin Moccasins on the right! If your size is no longer available in the MK mandarin moccasins, and now you are dying for some pop of color moccasins, there is an option HERE that comes in coral, turquoise, and yellow! And they are UNDER $45! 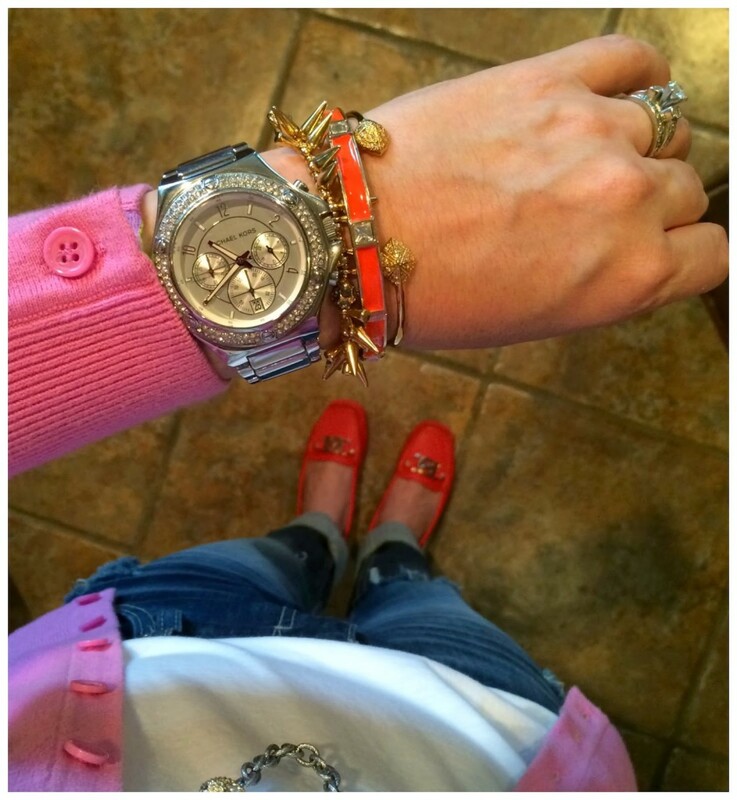 The spikey bracelet (in rose gold) that looks like my Stella and Dot renegade bracelet HERE. Pendant necklace HERE that is now UNDER $9 in both white and turquoise. 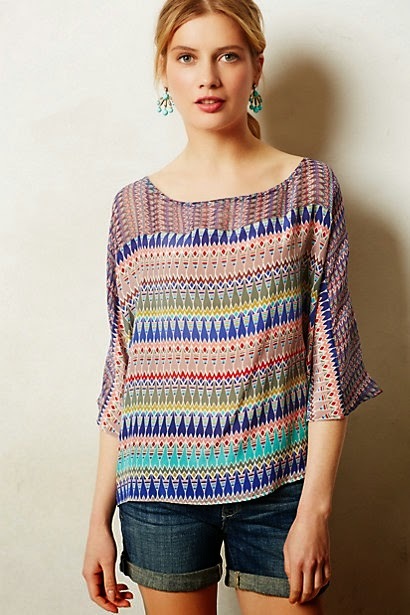 ANTHROPOLOGIE IS AN ADDITIONAL 20% OFF OF SALE ITEMS today through the weekend!!!! Click HERE to shop the entire sale. 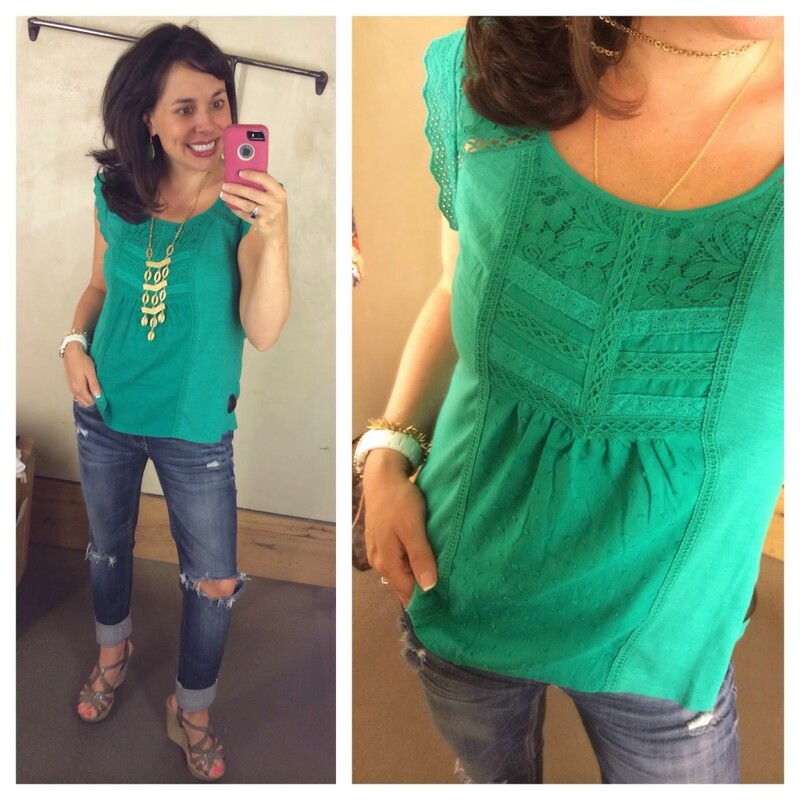 Click HERE for my kelly green lace top (also comes in navy and white, but you have to wear a cami under the white). And I’m totally smitten with THIS Anthro shirt. Has anybody seen it in person? The regular price was totally out of my reach at $168, but now that it’s an additional 20% OFF of $89.95 I’m considering it! A military anorak vest HERE. 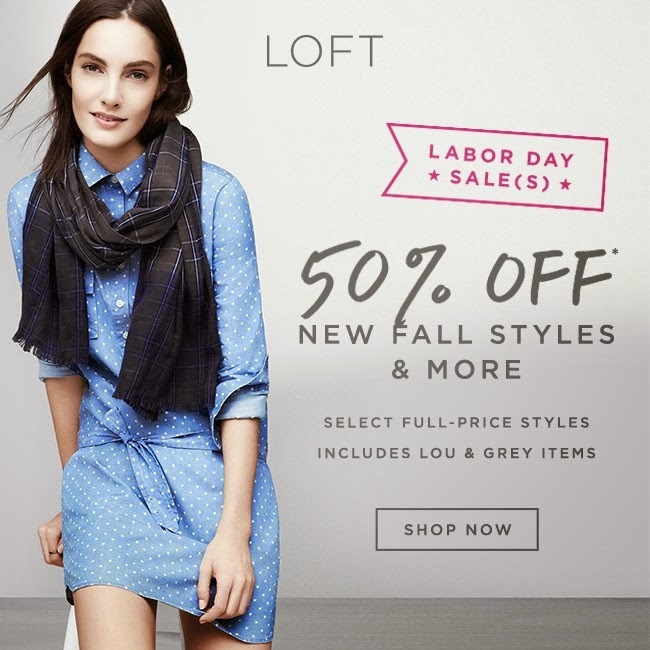 LOFT is 50% OFF select new fall items with lots of great choices! Nordy app open! Thanks for all the ideas!! sounds amazing esp after just finishing our bottle of wine! LOVED the e-mail! You sound like my kind of girls! Julie and Susan…or Susan and Julie….not really sure the order! ha! I also got this picture from Ashley, one of my regular readers, when she was on her anniversary trip in Playa Del Carmen! So cute! 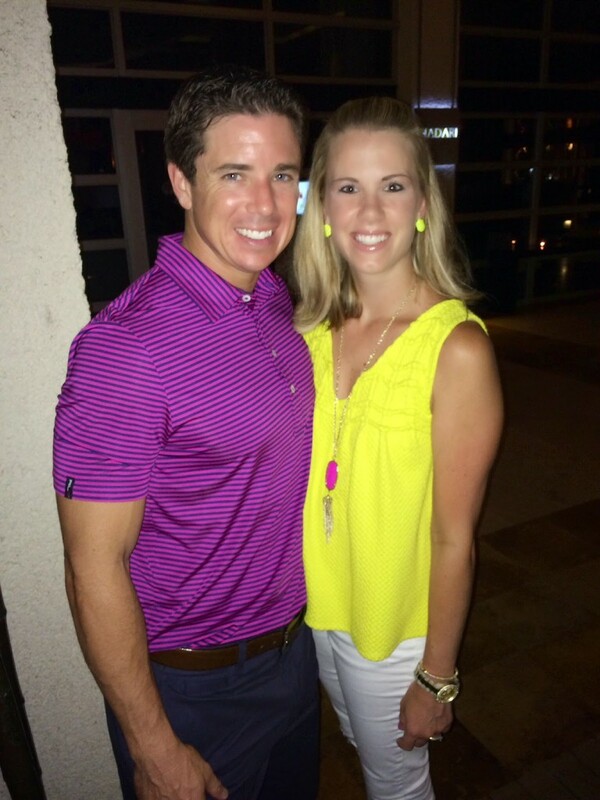 Ashley is wearing the magenta Rayne necklace and the neon yellow Morgan studs! This would be a great time to pick up my favorite abalone elle earrings for fall! If you want to take advantage of the code but need help deciding what you want, you can review the MUST HAVE announcement of the Kendra Scott jewelry HERE. You’ll get to see lots of different pieces styled lots of different ways! And you’ll get to see my favorites! Click HERE if you are new here and want to see a MUST HAVE review! Wanna win $500 to William Sonoma? UM. OF COURSE YOU DO. 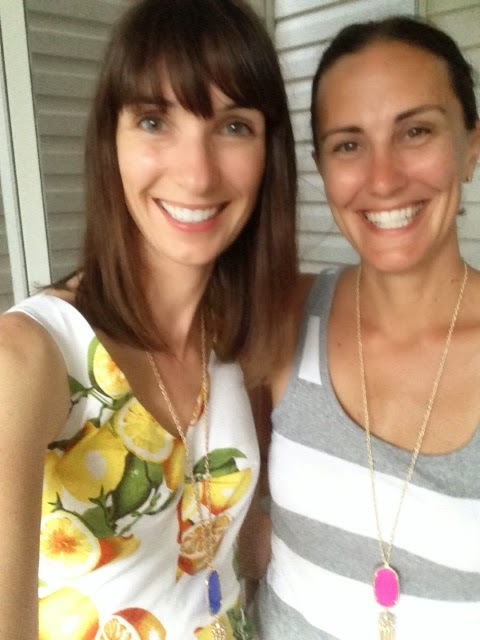 Yesterday marked the 3 year anniversary of my friend Shay’s Mix and Match Mama site! Shay is hosting a super easy contest where you just pin some of her images to enter! 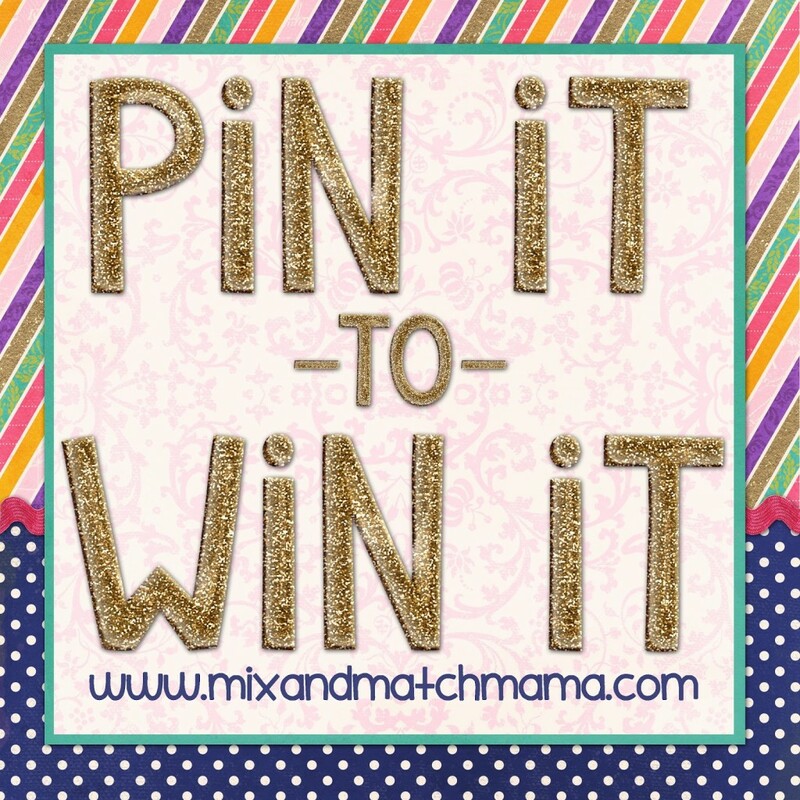 Go over HERE to read about the contest….pin like a crazy person…and then cross your fingers that you’ll be the winner! 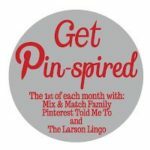 Get Pin-spired: Brought to You Today by the Most Worn Item In My Closet! Oh my heavens! The zippers on those Converse are just about the cutest thing I have EVER seen! Love them!! And your black was so simple and yet perfect at the very same time. Yay for Friday friend!! You may have just sold me on the converse! 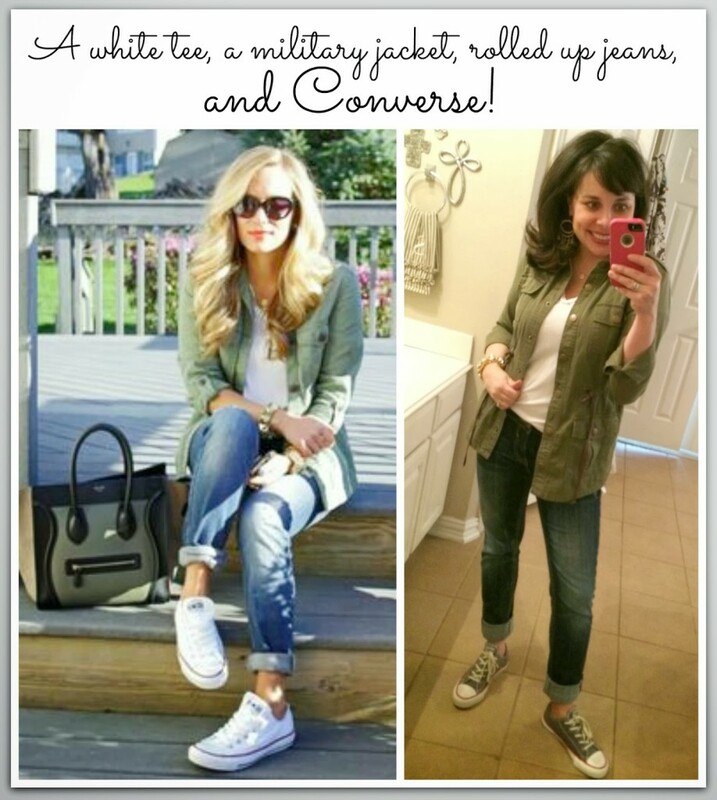 I wear my white converse all of the time but I think I need the gray zipper pair too! 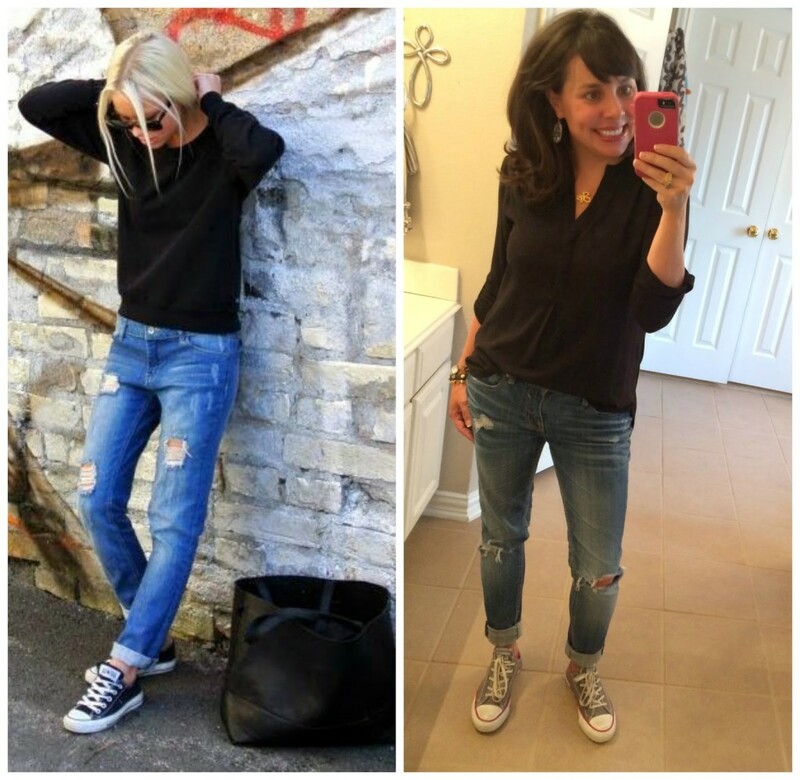 Love the must have shirt, distressed jeans and converse combo! Thanks for hosting the linkup! Girl!!! You know I'm a fan of the Converse! This year…Ebby Lee is too!! Great post, but the link for the moccasins under $50 takes me to a V-neck t shirt that's styled in a really weird way. Hi Peggy! I fixed the link! Thank you so much for bringing it to my attention. And that t-shirt that the link originally went to? That is my favorite white v-neck. But I agree 100%. Not a fan of how it was styled! Pretty sure I need some Converse in my life!! Wow. You really do wear that shirt a lot. The link to the Converse sale takes us to the Destroyed jeans. Sorry. Hi Riley! I don't know why all of the links are acting up today! I fixed it!!! Thank you so much for letting me know!!!! Converse are the best! I have a grey pair and a polka dot pair, Love them! You rocked your looks! I had the pendant necklace in my cart yesterday and told myself I didn't need it…. but you just confirmed I do! HAHA! Order placed 🙂 Can't be $9! Have a GREAT weekend! I just ordered a pair of earrings and necklace from the Kendra Scott website AND they were on sale AND THEY WERE 15% OFF!!!!! HOLLA!!!!!! P.S. They were Elle earrings and the Rayne necklace. I love that you've embraced Chucks. They are one of my all time favorite shoe and really do go with so much! 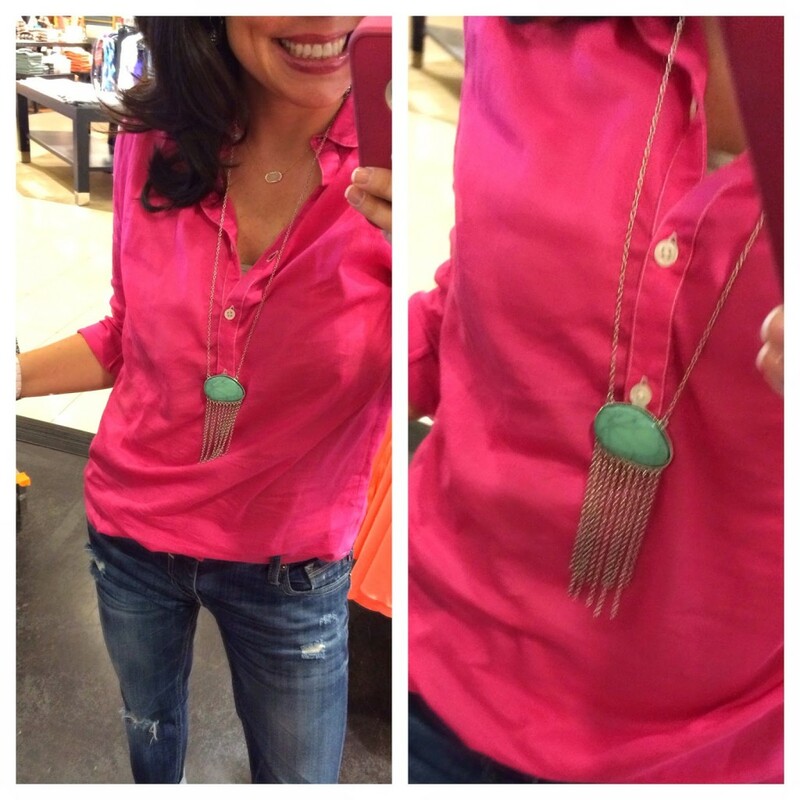 And YES to the Kendra Scott sale! Heading over now to shop! 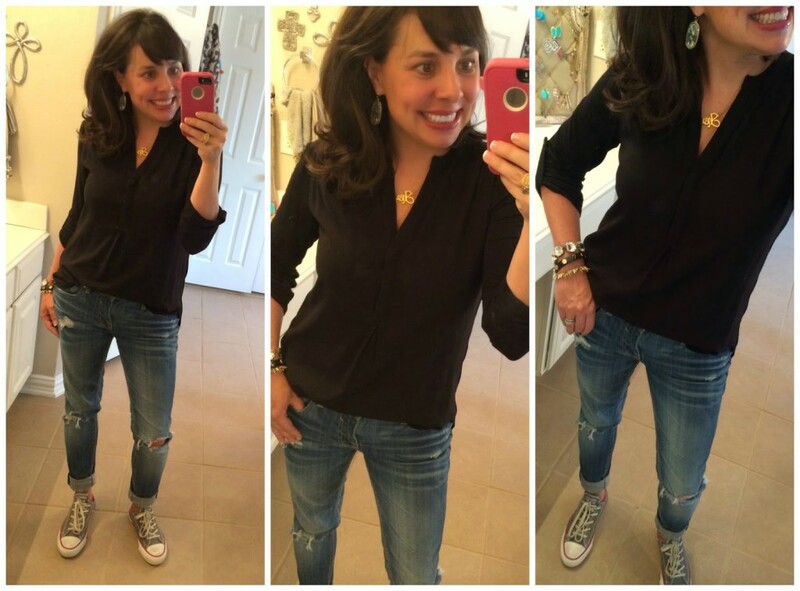 I love the blue/gray crossbody bag in the last of your converse pictures! What's the brand? Hi Sarah! It's Rebecca Minkoff. I got it for Christmas last year and it's been sold out since December. Sorry I don't have better news! Hi there! Thanks for all your tips!! And fyi…jcrew is having an additional 40% off sale items with code 'weekend'! Have a great Labor Day weekend!! How does the green anthro top fit? I looked at the reviews and saw both true to size and runs large, so I want your take. Hi Christine! I would say true to size. I got a small. Oh my goodness, Sheaffer, once again so many cute looks! I have never owned any Converse sneakers before, but with so many cute outfit combos, I'm reconsidering adding some to my closet. Also, now I must head over to the Kendra Scott sale to scope out more fun things to add to my wardrobe. Thanks for hosting this linkup — it's so fun!! Just adorable! I'm looking forward to weather where we can start wearing sneakers again this fall. They are so cute with cuffed jeans!